Services of the SAF have specific equipment, organization, training and purpose. They provide one of the capabilities related to command security and support. The Manpower and Personnel is tasked with managing human resources, thus providing and preparing, according to the structural requirements, the required number of personnel (by their qualifications, education, specialties, work experience, etc.) for efficient functioning of the Serbian Armed Forces. The Manpower and Personnel has the mission to: supervise and analyze manning; to make annual and mid-term planning in order to provide all categories of personnel; to carry out activities related to recruitment, selection and admission of personnel; to plan career of personnel; to provide direct personnel service support; to evaluate efficiency and capability of personnel; to carry out activities related to promotion of personnel; to plan education of personnel in the country and aboard and their selection; to keep records of personnel and make documents on personnel records; to monitor and report on peacetime and wartime manning. Some changes have resulted from development and modernization of the armed forces, not only in physical but also human resources, thus urging the Manpower and Personnel to follow the changes and undertake adequate measures in order to address ever-growing challenges. The Manpower and Personnel is characterized by its ability to follow and adjust the development of the armed forces, as well as to undertake adequate measures. The Manpower and Personnel Service exists in all units, commands and institutions of the Serbian Armed Forces, the battalion being the lowest one. The Manpower and Personnel Service is organized into departments, sections, groups and cells. Depending on the command level and line of duty, each of these units carries out tasks related to personnel. The Manpower and Personnel Service is one of the newest services in the Serbian Armed Forces, since it was officially introduced as the general service in 2008. September 1 is the Day of the Manpower and Personnel, because on this date the so called “personnel year” begins and the most important activities from this field are carried out and analyzed until this date. The Manpower and Personnel has existed almost since establishing the armed forces as an institution, but certainly since establishing the modern armed forces. Today it is impossible to imagine any armed forces without a professional manpower and personnel service. The Telecommunication and Information Systems Service has the mission to provide the Ministry of Defence and the Serbian Armed Forces with uninterrupted telecommunication and information support, and security of information in peacetime, states of emergency and wartime. The Telecommunication and Information Systems Service support is responsible for dissemination, sharing and security of information, being supported by the adequate telecommunication and information system. The Telecommunication and Information Systems Service is tasked with planning, dissemination, sharing, electronic processing and protecting of information for the needs of the defense system of the Republic of Serbia. These tasks are carried out by the Telecommunication and Information Systems Service in cooperation with other holders of the telecommunication and information systems. The Telecommunication and Information Systems Service is divided into two services, but basically they are the unified entity making projects and building the telecommunication and information system of the Ministry of Defence and the Serbian Armed Forces, with the aim to provide telecommunication and information support for the needs of the Ministry of Defence and the Serbian Armed Forces. The main implementers of the telecommunication and information support in the Ministry of Defence and the Armed Forces are bodies, units and institutions of the telecommunication service and information service, which cooperate on carrying out tasks with other holders of telecommunication and information systems. Depending on the unit of the Armed Forces which it supports, the aim to be achieved, its significance and the number of the measures undertaken, the telecommunication and information support in the Armed Forces is planned, organized and continuously delivered at the strategic, operational and tactical level. At the proposal of the Minister of War, on September 20, 1916, the crown prince Aleksandar Karađorđević, approved the Regulation on Military Telegraph, based on which the signal units were drawn out from the engineer branch and became battalion-regiment size units, as a result of which, the signal units became the independent army branch. On passing the Regulation, the foundations of organizing signal units in the Serbian Army were laid. The signal units have evolved and been modernized until present day along with the development of the army. In the Serbian Armed Forces, September 20 is celebrated as the Day of the Telecommunication Service. As a result of a need to improve military administration and administrative service in general, the Sixth Department of the General Staff of the Yugoslav People's Army was established on February 21, 1963. The Data Processing Center was subordinate to the Sixth Department. That date, February 21, is celebrated in the Serbian Armed Forces as the Day of the Information Technology Service. The Sixth Department (in charge of administration) worked out the system of administrative business-doing, organized and kept records and statistics in the Yugoslav People’s Army, and it managed the administrative service professionally. The first computer UNIVAC-1004 was procured and installed in 1964 and the electronic computer ICL 4-50 was procured in 1968. The Information and Administration Department and the Data Processing Center were established on June 23, 1975. In 1983, the administrative service changed its name into the information service, which is divided into two branches: the information branch and general administration branch. The Air Surveillance and Warning Service (ASW) has the mission to provide uninterrupted surveillance over the entire airspace above the Republic of Serbia and access to its airspace, to detect, identify and survey all aircraft in the airspace reliably and on timely basis, to provide radar support to the Air Force and Air Defence units and to inform the SAF units and commands, as well as citizens, about the current situation in the airspace. The ASW units are equipped with radars, height-finding radars and automatic devices. It is organized in the Air Surveillance, Warning and Control (ASWC) platoons, companies, battalions and the brigade. The history of the ASW began on June 18, 1915 when, based on the decision of the minister of war, the signal stations were formed in the disposition area of the Drina Division, Timok Division and the Combined Division. The surveillance units were tasked with reporting the flight routes of the enemy and directing the Serbian Aviation on the enemy. Since then, when the airspace was surveyed by random means, until today, when airspace is surveyed by radars, the ASW has developed and improved alongside the air force, because of which it was originally established. The first ASW units were formed after the Second World War, and they were equipped with 1D radars coming from Western countries. The first modern ASWC units were formed in 1956, when they were organized in the ASWC regiments and battalions. By the end of the 1950s, the ASW units were equipped with the P-series radars (P-12, P-15, P-14, P-35) coming from Eastern countries. In 1970s and mid-1980s, the S- and TPS-series radars were imported. 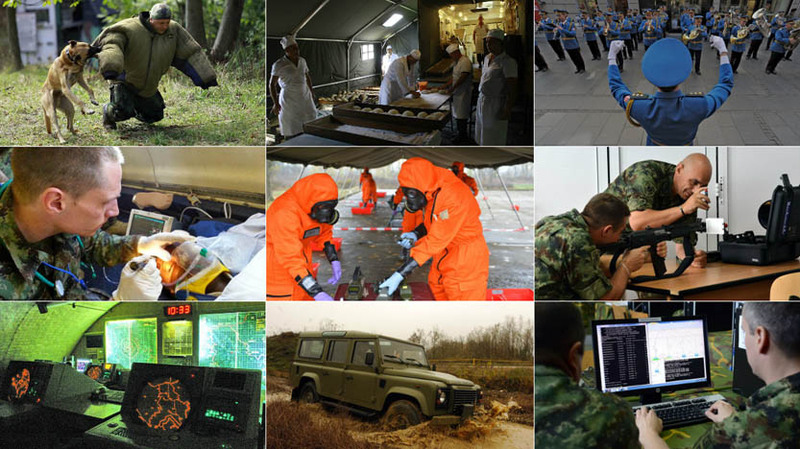 The Chemical, Biological, Radiological and Nuclear (CBRN) Service is the general service in the Serbian Armed Forces which has specific equipment, organization, training and use. Its task is to provide nuclear, chemical and biological defence. The CBRN is an integral part of the defence system of the Republic of Serbia, being responsible for organizing and implementing specialists’ work within the CBRN defence, such as: establishing the efficient CBRN system; planning and education of the NBC personnel at the national and regional level; building cooperation with partner CBRN systems; equipping units with NBC agents; research and development of the CBRN items; preparing and employing CBRN units for peacekeeping operations; development and improvement of training and doctrine; elaboration of new rules and directives; scientific and publishing business, and development, organization and management within the CBRN service. The CBRN has the mission: to conduct CBRN control including reconnaissance, laboratory analyses and CBRN decontamination after an CBRN weapon has been used; to train officers, NCOs, the SAF units, commands and institutions in preventing and addressing CBRN hazards; to make plans and respond to situations hit by CBRN weapons in peacetime; to implement the Chemical Weapons Convention and other international regulations, as well as to help civilian institutions and citizens in CBRN accidents, natural disasters and other accidents. The CBRN Service has a decisive role in addressing problems imposed by the use of CBRN weapons in wartime and in protecting the Armed Forces from NBC accidents in peacetime. It is qualified and equipped to successfully carry out tasks during warfare. The CBRN service is made up of the CNRN Training Centre being responsible for specialist training of the CBRN soldiers, training of the CBRN personnel inside and outside the Armed Forces at the national and regional level, and the CBRN battalion. To implement the above said objectives, equipping with modern items is of major importance, being: CBRN protection items, CBRN control and decontamination items, state-of-the-art items used in mobile laboratories, and the items used to detect toxic industrial chemicals and other hazardous materials, and to carry out the decontamination process. The first CBRN unit (the Barutana Battalion), a forerunner of the CBRN units in this area, was established at the Obilićevo Institute in 1932. The CBRN branch has constantly been developed, strengthened in terms of organization and personnel, and it has always managed, even at times of hardship, to fulfill its duties and tasks. The Intelligence Service has a mission to continuously collect, process and use intelligence (information, estimates) related to the current situation and adversary intentions (threats), the area of the employment of forces and right timing in order to avoid surprises and respond on timely basis to the newly arisen situation. The main tasks of the Intelligence Service are: to build and maintain operational and functional capability of the intelligence; to monitor indicators of the security threats to the Republic of Serbia and the Serbian Armed Forces and to prevent surprises; to monitor activities of foreign countries, military and political alliances and their armed forces in the area of intelligence responsibility and the area of intelligence interest; to make the intelligence preparation of a theatre of operations; to update the integrated intelligence data base; to support selection process of fixed targets and to estimate effects of fixed targets, to support force protection and to cooperate with other structures. The Intelligence Service of the Serbian Armed Forces is composed of intelligence bodies at all command levels, capacities to collect intelligence, information systems, intelligence data bases and users. The state-of-the-art equipment is used for achieving missions of the Intelligence, being: optoelectronic devices and means and systems with electronic effect. Immediately before the transition to the peacetime period, when the rest of the Staff of the Supreme Headquarters was to be converted into the General Staff of the Kingdom of Serbs, Croats and Slovenes, the Regulation on the Main General Staff and general staff vocation was issued on April 10, 1920. The Main General Staff used to have four divisions: the Operations, the Intelligence, the Transport and the Institute of History and Geography. organization of work on suppression of enemy operations related to collection of data about our army and country. The Intelligence division of the Main General Staff of the Army of the Kingdom of Yugoslavia was developed functionally and structurally and it always had two main functions: military intelligence and counterintelligence. In addition to that, it pointed out the necessity to intensify psychological propaganda. The number of units and sections was increased so that in 1940 it was transformed into the Second Directorate of the Main General Staff with two intelligence divisions and several intelligence centers. Its work was predominately successful and, in an objective manner, it informed the military and state leadership about numerous activities of internal and foreign enemies. Before the WWII, the Intelligence division was divided in the First and the Second section out of which the first one was responsible for intelligence and the other one for counterintelligence activities. The Geodetic Service of the Serbian Armed Forces is a multi-service department which has the aim to plan, organize and conduct land survey, to collect data about an area, to elaborate and publish geospatial materials, to apply the system of geodetic and topographic support to the Serbian Armed Forces and other defence-related entities in peacetime and wartime, and to perform other tasks from its area of competence. The Geodetic Service of the Serbian Armed Forces is organized in the Geodetic Service Council and the Military Geographical Institute. At its disposal it has a state-of-the -art digital camera for aerial photogrammetry images, a variety of geodetic instruments for various uses, and adequate printing capacities. The Geodetic Service of the Serbian Armed Forces is one of the oldest services in our army. It was founded on February 5, 1876 when an independent body of the General Staff was given jurisdiction over the tasks, which are even today known as the tasks of the geodetic service. After the WWII, the tasks falling within the geodetic service were carried out by the First (Operational) Department of the General Staff, and executive tasks were performed by the Military Geographic Institute. The Meteorological Service in the Serbian Armed Forces is responsible for observing, monitoring, processing and warning about meteorological and hydrological conditions, and for weather forecasting in order to make prerequisits for accomplishing tasks. Apart from that, it carries out the climate research of the area. The Navigation Service is tasked with collecting, processing and dissemination of information to commands and units on hydrographic and navigation conditions having an impact on preparation and accomplishment of a task. The data are collected for a certain period of time. The most important meteorological data are: direction, velocity and character of wind, temperature of air and soil, and cloud amount. The most important hydro-meteorological data are: water stage, flow rate and tendency of water stage. In the planning process, the impact of hydro-meteorological conditions on the course of operations and the conduct of operation are taken into consideration. The SAF commands and units use meteorological and navigation data delivered by the competent authorities of the Serbian Armed Forces and relevant institutions of the Republic of Serbia. The Meteorological Service developed alongside the military Air Force, and it began with poorly equipped stations and personnel trained in courses, while today it is a modernly equipped service with the personnel educated at military academies and universities. The first meteorological station for air force needs was founded in Belgrade on November 1, 1919. It was formed out of the French meteorological station brought from the Salonika front. The Air Force command at that time was interested in further development and modernization of the meteorological service, and on November 1, 1923 the Meteorological Section of the First Air Force Brigade was esatblished in Petrovaradin, which laid foundations for further development of the air force meteorological service. Before the outbreak of the WWII, the sections grew to meteorological platoons. In the WWII, the network of meteorological stations was destroyed, along with all meteorological institutions and all meteorological instruments and devices. Founding and development of a new meteorological service began in 1943 by forming the Meteorological Section as one of the bodies of the Supreme Headquarters of the People’s Liberation Army and Partisan Detachments of Yugoslavia. The first meteorological station was established at the beginning of 1944 in the island of Vis, for the needs of the Navy of the People’s Liberation Army and British Air Force, and at that time courses were organized for training the meteorological personnel. The new period in history of the meteorological service began in 1988, when military and civil air traffic meteorological service were integrated within the Federal Air Traffic Control Authority, thus becoming the competent authority for providing meteorological services to both civilian and military aircraft at all airports and above the entire territory of the Republic of Serbia. The Legal Service is tasked with acting in administrative proceedings of first and second instance; acting in administrative proceedings for making decisions according to proposals in order to apply extraordinary legal means; preparation of statements of defence and representation in administrative disputes; legal control, i.e. control of the rule of law in administrative matters; evaluation of regularity of acts by means of which state of affairs in the professional service of the SAF members are regulated; monitoring the field of normative documents referring to the Serbian Armed Forces and normative and legal affairs being in the line of duty of the Chief of the General Staff; participation in elaboration of laws and by-laws; preparation of opinions on draft laws, by-laws and other general acts from the point of view of the SAF commands, units and institutions; direct cooperation on legal issues with the bodies of public authority of the Republic of Serbia; acting according to letters filed by the Ombudsman; acting according to letters asking for delivery of information of public importance; participation in proceedings to discuss responsibility for inflicted damage; providing direct cooperation and assistance to the Manpower and Personnel Service; carrying out of military disciplinary investigations and disciplinary practice due to petty violations of military discipline; filing and pleading for plaintiff’s bill (military disciplinary prosecutor) and trials for serious breach of military discipline (military disciplinary courts). Since its founding, the military Legal Service has changed its organization and role, but it has always adapted to the needs of the state and the army. When the Military Law regulating organization and proceedings before military courts was passed on October 31, 1839, in Europe there were only two other laws regulating the military criminal law. Pursuant to provisions of the Military Law, the courts at that time were organized as the courts of first instance at battalion commands and as courts of second instance, i.e. appellate courts at main military headquarters. The turning point in military jurisdiction is adoption of the first military judicial law in 1864, during the reign of the Prince Mihailo Obrenović, when the army and entire state administration were reformed to a great extent. This Law was drawn up according to the French military law, and the date when it was passed is celebrated as the Day of the Legal Service of the Serbian Armed Forces. In 1901, the Law on Organization of Military Courts brought some new issues, because court- martial was established which became active in war. Military courts of first instance were organized at the division level in the armed forces of the Kingdom of Serbia, and the military court of second instance, with the seat in Belgrade, had the name of the Great Military Court. The State military attorneys were present only at the courts of first instance and they had their own management. In 1955, the jurisdiction of military courts was extended to property and administrative disputes. The officers of the SAF Legal Service fulfill the duties of their area of competence in the SAF units and institutions that are subordinate to the General Staff, as well as to the organizational units of the Ministry of Defence. The Music Service is a specialist service which is tasked with cherishing and developing the art of music in the Ministry of Defence and the Serbian Armed Forces. to supply and maintain musical instruments and equipment required for the work of the Ensemble and Service bands. The organizational unit of the Ministry of Defence being in charge of culture and tradition is superior to the Army Music Service and it is composed of the Artistic Ensemble of the Ministry of Defence "Stanislav Binički", the Representative Orchestra of the Guard, the Niš Military Orchestra and the Musical Section of the Company for Paying Tribute of the Command Battalion of the Training Command. In 1831, the Representative Orchestra of the Guard, under the name Knjaževsko-serbska Band, was founded by a decision of the Prince Miloš Obrenović. The first chief of the orchestra was the bandmaster Josif Šlezinger who were succeeded by Stanislav Binički, Franc Klinar and others. At the beginning of 20th century, Stanislav Binički founded the Royal Guard orchestra. It was the only professional orchestra at that time in Serbia, but it was the source of all professional ensembles of today. The Royal Guard orchestra is a forerunner of the modern Service bands and the Representative orchestra of the Guard. During almost two centuries of its existence it participated in all major events of the modern Serbian state and it became world-known. Nowadays, Service bands participate in marking the most important state and military ceremonials, and the Army Music Service contributes with its performances to sustaining and cherishing culture and traditions. The Chaplaincy Service is the method of organizing activities of traditional churches and religious communities in the military and it also includes conducting of religious services in the Serbian Armed Forces. The aim of the Chaplaincy Service is to make it possible for the members of the Serbian Armed |Forces to exercise their constitutional right to freedom to religion, which is only exercised at someone’s free will and based on religious affiliation, on the principle of voluntarism, but complying with the rules of the military service. The Chaplaincy Service is tasked with developing and strengthening spiritual and moral values of the SAF members, as well as with cherishing military virtues and patriotism, and forming of civil liability. The Chaplaincy Service has the mission to support development, building, maintaining and increasing operational capabilities of the Serbian Armed Forces while conducting all missions and tasks. The activities of the Chaplaincy Service include religious service and other religious activities being conducted at the barracks according to the law and autonomous regulations of the church, i.e. the religious community. The Chaplaincy Service is organized through the Chaplains’ Department and the Chaplains’ Group. Military chaplains and the chaplaincy service were introduced in 19th century for the first time and they were a part of our army until the first half of 20th century. Military chaplains and religious service in military units were guaranteed by two legal acts in the Principality of Serbia. The both legal acts were passed in 1839. The first was the Law on Organization of the Garrison Army (passed on 31st May) and the other was the Law on the Armed Forces (passed on 31st October). Chaplains in the units conducted religious service and they were examples of Christian virtues. The status of the armed forces and the chaplaincy service were specified by the Law on Organization of Standing Army (1860) and the Law on Organization of the National Army (1861), but the chaplaincy service is best described in the legal act - the Organization of the Entire Army, adopted on 24 February, 1876 - on the eve of the war with the Ottoman Empire. Military chaplains were assigned to the Supreme Command, division and brigade commands. It was laid down by law that the Supreme Command should have a military bishop, who was in charge of all chaplains. Military chaplains used to have the status of government employees having identical entitlements as officers. A special attention was paid to studying religion, which was obligatory for all soldiers and cadets. During conflicts, a military chaplain was appointed by the chief of General Staff. The duties of the military chaplain were to take care that all chaplains were at the right positions to pray, to support soldiers, thus strengthening the combat readiness and to deliver Holy Communion to dying soldiers. The Serbian Armed Forces used to have a certain number of military imams and military rabbis who fulfilled their duties on an equal footing with orthodox priests. At the initiative launched by Serbian archbishop Dimitrije, the catholic chaplains were introduced at the Salonika front for the first time in order to make it possible for Austrian and Hungarian prisoners of war to exercise their religious freedom. The same principle of organizing the chaplaincy service until 1918 was later used in the armed forces of the Kingdom of Serbs, Croats and Slovenes and later in the Kingdom of Yugoslavia, but having in mind multiethnic and multi-confessional society, all registered churches and religious communities were entitled to chaplains. The Chaplaincy Service was abolished after the Second World War. With the Law on the Serbian Armed Forces which came into effect on January 1 2011, all legal provisions were met to regulate this field. Based on this Law, on March 24, 2008 the Government of the Republic of Serbia laid down the issues related to religious freedom exercised by members of the Serbian Armed Forces by the Regulations on conducting religious service. The Law on the Serbian Armed Forces also regulates that special agreements on religious service should specify the interrelationship between the Ministry of Defence and churches, i.e. religious communities. The agreement signed between the Ministry of Defence and the Holy Synod of Bishops of the Serbian Orthodox Church was signed on June 28 2011, and agreements with other six traditional churches and religious communities (Roman Catholic Church in Serbia, Slovak Evangelical Church, Reformed Christian Church, Evangelical Christian Church, Jewish community and Islamic Community in Serbia) were signed on October 18, 2011. By signing the agreements, it was made possible for the Regulations on Religious Service in Serbian Armed Forces to be applied. With eight Orthodox chaplains, one Roman Catholic chaplain and one imam having entered the military service and having been appointed, the Chaplaincy Service was reintroduced in the Serbian Armed Forces on August 1, 2013. With Orthodox and Roman Catholic chapels having been consecrated and with the chapel for Muslims having been opened, all preconditions were met to conduct religious service and rites in commands and units of the Serbian Armed Forces. The Technical Service is a logistic service which within its logistic support, maintains and equips SAF units and institutions with weapons and equipment. It is structured and organized to provide continuous and complete logistic support in SAF missions on timely basis, as well as to efficiently carry out other tasks from the scope of its competence. doctrinal and normative regulation of its tasks, maintenance and development of the Technical Service and technical and technological documents during the process of development, production and procurement of finished products. The Technical Service of the Serbian Armed Forces follows and studies technological development in the world as well as its impact on operational capability of the SAF. It supports the SAF in development, procurement and maintenance of weapons and equipment with adequate manning, rational organization and material assistance. It continuously works on building logistic interoperability of the SAF and international technical cooperation. Along with the reform of the SAF, the Technical Service has been reorganized as well, and the integrated technical service with 102 specialists was established out of the land forces’ technical service, air force technical service and naval technical service. The technical Service is organized at the strategic, operational and tactical level. It accomplishes all missions through its administrative and executive bodies established at relevant command levels. The executive bodies of the Technical Service – the maintenance units and institutions, and procurements units, use the equipment which includes means for recovery and evacuation of movable property, mobile workshops for operating in the field, workshop equipment, a variety of tools, special-purpose and general-purpose measuring instruments, and special-purpose equipment used for testing in institutes and the Testing Center. The Technical Service celebrates its day on September 15. On that day in 1891, the production of nitrocellulose (smokeless) powder was launched at a Gun-Powder Plant Obilićevo, near Kruševac, which made it possible for the Institute from Kragujevac to improve production of ammunition7x57mm for the Mauser rifle M-1899. In terms of development of concept, organization and technology after the Second World War, the Technical Service became a leading service if its kind in the region in various segments of maintenance and supply. The applied outcomes served as models to improve relevant services of foreign armies. Founding and development of the Military Technical Institute and the Technical Testing Centre considerably contributed to building defensive power of the country. These institutions made it possible for new research and development projects to be made in the Military Technical Institute in Belgrade and their verification in the Technical Testing Centre. The Quartermaster Service is the oldest logistic service which, within tasks of logistic support, carries out general logistic activities and supply units and institutions of the Serbian Armed Forces with quartermaster movable items and. The general logistics has the mission to create better conditions for working and living of the SAF members, and it is of major importance for morale, motivation and functional capability of the SAF units. providing a variety of services. The Quartermaster Service is characterized by lawful establishing of a consistent, economical and dynamic organization which is connected with relevant state institutions and society stakeholders and which uses available capacities of the society in order to integrate supply, production and service trades and capacities within the logistics of the defene system of the Republic of Serbia. Apart from the above mentioned characteristics, the following ones are also important: integrity, continuity, completeness, effectiveness and efficiency, territoriality, autonomy, flexibility, mobility and interoperability. machines, devices and other means for equipping production and service-delivery capacities. The word “intendant” (quartermaster) comes from the Latin verb “intendere” which means to manage something, to control. It is considered to be the oldest logistic service, and the facts indicate that 1000 years B.C. there were warehouses in the Ancient Egypt and that food for soldiers were carried in bags. In our country, during the First and Second Uprising, supply bases were organized in some places in order to collect food from abroad, and food stores were built in trenches, fortresses and towns. On September 14, 1885 the Main Quartermaster Corps and Administration of the Supreme Headquarters were formed. In memory of that event, September 14 has been celebrated as the Day of the SAF Quartermaster Service since 2008. In WWI, food items were provided on the site where the troops were deployed, and the products were provided before or during the fight in an area called “operational base”. In WWII, the Quartermaster Service was characterized by flexible and functional conformity with the conditions and the capacities of that time. The Quartermaster Service successfully carried out supply-related tasks along with its development and evolution, and after the war it provided the army of almost one million soldiers. Today, the Quartermaster Service, with the developed organization, technique and technology, good quality and qualified personnel, is a firm foothold to all units and institutions and as such it is ready to support all tasks in the allocated missions of the Serbian Armed Forces. The medical service is a logistic service and within its logistic support “medical care” organizes and provides medical care of SAF personnel. As part of preventive medical care, the Medical Service is tasked with: (1) health improvement and maintenance and (2) prevention of possible injuries and diseases. These tasks are put into practice by taking hygienic – prophylactic and anti – epidemic measures, radiological, chemical and biological medical protection measures. When tending the injured and the sick/ill there are the following tasks: triage, evacuation and medical treatment of the injured and the sick/ill, i.e. providing adequate forms of medical aid. The supplying tasks include procurement of basic medical equipment, medicaments and expendable medical supplies. The Medical Service functions through some government bodies and SAF in cooperation with civil health care institutions of the Republic of Serbia, by using own sources and capacities in accordance with the set authorities. The tasks of ROLE I, II and III medical care are carried out by relaying on own available capacities, as well as other capacities of the Republic of Serbia. At the SAF level there is ROLE I medical care (emergency and general medical care). 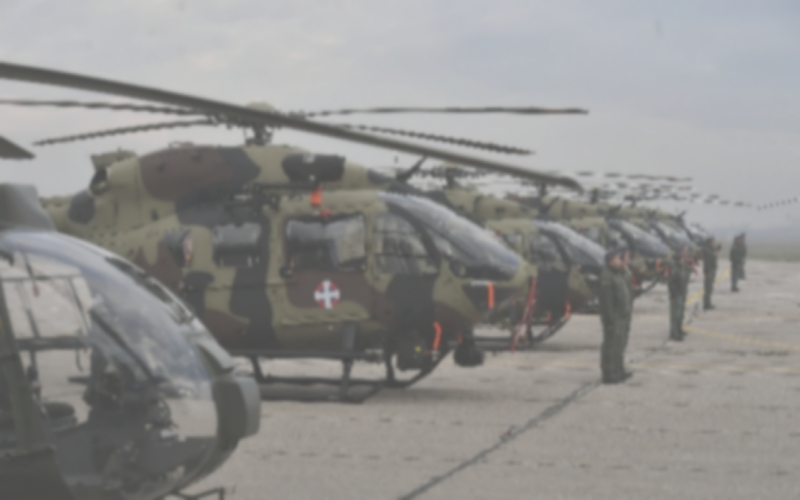 Military medical institutions of the MoD provide ROLE II (Centre of Military Medical Institutions Belgrade, Military Hospital Niš and Military Medical Centre Novi Sad) and III (Military Medical Academy) medical care. The organisation consists of the governing and executive bodies of the medical service. The governing bodies manage the service and are responsible for its work, while the executive bodies provide medical care for the users of military health insurance. The Veterinary Service is a logistic service which its logistic support referring to “health care”, organizes and provides: 1) health care for animals, 2) maintenance and building of animals’ work ability and 3) health safety and hygienic quality of animals for slaughter and food products of animal origin in the SAF units and institutions. meeting all criteria and conditions for the work of units in winter and summer and supply of basic veterinary materiel, medicines and consumables. There is the primary health care (emergency and general practice) at the level of the Serbian Armed Forces and the excellent cooperation has been established with civil institutions dealing with veterinary science. The Service is composed of governing bodies, which manage the Service, and executive bodies, which provide measures of health safety and hygienic quality in the units and organizations which provide food to the Serbian Armed Forces, and they also deal with training of dog handlers, breeding and training of dogs. Military veterinary science was the initiator of developing veterinary science in the Serbian state. The date when the veterinary service was founded is November 1, 1851, when, based on the decision of the Prince Aleksandar Karađorđević, Jovan Teodorović was appointed the first animal doctor. He was a Serb from Novi Sad who completed the veterinary studies in Pešta in 1825.
cooperation and coordination with other government bodies and institutions in the field of traffic and transportation. Traffic and transportation are organized on multi-service basis as road traffic (road and railway traffic), air traffic and water traffic. The traffic is organized either by military means of transportation or by certified transportation agencies in accordance with the law. The peacetime organization of the Transportation Service adapts to new conditions if the war breaks out, making it possible for mobilization to be carried out and for the SAF units to change from peacetime to wartime organization. The Transportation Service is established from the strategic to tactical level, through governing and executive bodies. The SAF units and institutions are equipped with motor vehicles which are used for transportation of people and cargos, all-terrain vehicles which are used for towing and transportation, special purpose vehicles, and the vehicles of integral transport. Its baptism of fire, the Transportation Service had in the autumn of 1913, when the Albanians rebelled in Kosovo and Metohija and there were fights near the town of Gostivar. As a result, a part of units of the 12th Regiment of the Podrimska Combined Division was transported by cars without delay in order to reinforce defence of Gostivar. Development and modernization of means transportation had the direct impact on development of traffic, so the Transportation Service has had several phases of development since 1980 till today. The changes have been the result of the socio-economic conditions in the country but also of organizational decisions made in the Army. The Transportation Service celebrates its day on September, 15. The Construction Service has the mission to accomplish tasks related to spatial and urban planning, building and maintenance of facilities, property. The Service consists of governing and executive bodies, which are qualified to carry out tasks related to the mission of the Service: capital development, building and maintenance of facilities and flats. Since its founding in the postwar period until 1980s, the Construction Service was organized on the territorial principle. In 1996, the competences related to building activities were divided in the Ministry of Defence and the Serbian Armed Forces. The Building and Urbanism Sector in the Ministry of Defence was established in order to accomplish tasks related to spatial and urban planning, construction, property management, technical control and technical monitoring in the field of infrastructure. The Construction Department in the General Staff of the Serbian Armed Forces was established in order to accomplish tasks related to capital investment and regular maintenance of buildings and management of thermal power plants. After disaffiliation of Serbia and Montenegro, the Infrastructure Department was established in the Ministry of Defence in order to accomplish tasks related to spatial and urban planning, construction, capital investment of buildings, property management, technical control and technical monitoring in the field of infrastructure.